Honestly, guys and gals: it takes a whole lot to be authentic online. As much as I intend to present everything as it truly is on this blog, I also leave out details about my personal life and self as a means to create a somewhat "better" version of reality. I suppose this is human nature, and I don't enjoy whining. But, after reading Ashley's and Sarah's and Erin's Things I'm Afraid to Tell Yous, I'm realizing the value in more vulnerability. So here goes... everything? Please don't be harsh. I know I'm hardly perfect. Although solely understanding has it's benefits, I feel inadequate for not being fluent in Spanish. I should speak Spanish. With a grandmother from Colombia and a father from Mexico (and plenty of other multilingual family members), there's really no reason for me not to be bilingual at this very moment. And yet I'm not. According to my grandmother, when I was too young to remember, she tried to speak to me solely in Spanish. Do you know how I responded? "Grandma, hablame normal por favor." Also known as, "Grandma, speak to me normally please." Yes, her and my dad should have been consistent and persistent (having interned at Lucie Berger in Strasbourg, I've seen how remarkably fast children can pick up new languages), but I also played a small role. Boo. I will literally spend the rest of my life working at it. I wish I could control matters of the heart. I understand I have no say in how people feel about me, but must I really go on caring about those I'd rather forget about? It's just inconvenient. Furthermore, I'm too gosh darn picky with future prospects. I agree, dating should be fun and one should not settle, but it is so beyond frustrating to be good at meeting people that are as interested in me as I am unenthused about them. What is my deal? Just because this would be an awfully awkward time to have a boyfriend, doesn't mean I wouldn't like to meet someone who I actually want to exchange flirty texts and go on fun dates with. Prince Charming, that's your cue. I promise to be nice. Gosh, I'd like to be more athletic. Most of the time I am very content with a moderate yoga practice, infrequent barre classes, and walking as much possible, but I honestly wish working out came more naturally to me. It seems as though everyone else happily exercises at least four times a week. It's a part of their routine, and thus, they are almost always fit. I, on the other hand, go through habits of running or fitness classes far too quickly to ever maintain a consistently strong bod. I just want to maintain my active lifestyle (and weight) abroad. I miss my friend. Humility aside, I like to think I have lots of friends; and that's just because I've done numerous random activities and walked away with at least one person worth keeping in touch with. With that said, I lost one special friendship a little over a year ago. The absolute worst part? I have no idea why. Even with a busy social schedule, it's hard to accept I'll most likely never see her again. I doubt I'll ever really get over it. Also, same exact boy troubles. Literally. I feel 'ya. Your honesty is refreshing! 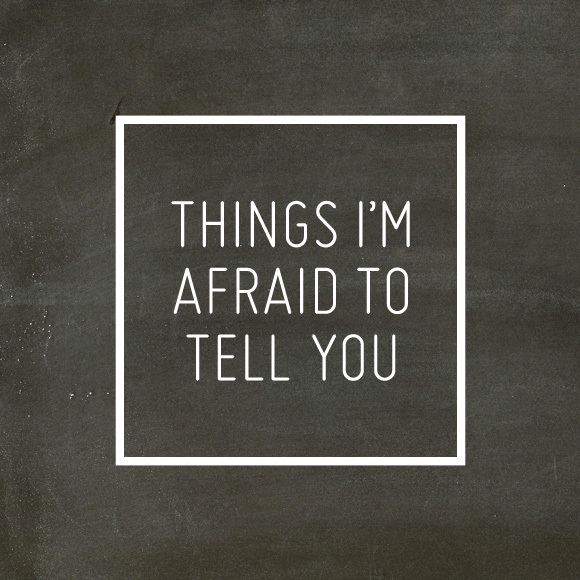 I love the concept of "Things I'm Afraid To Tell You." I've been reading so many articles lately about how social media comparison is like looking at your "behind the scenes" against another person's "highlights." There is definitely some truth to it, which is why I think that it's good to sometimes share our fears and doubts on here, too. I have gone through some of the same issues with friends in the past year. And with any major life change comes excitement and all those terrifying "what ifs?" I have no doubt you are moving in the direction you are meant to be in, as scary as it is, and know that this upcoming experience is going to be wonderful for you! Amen to this. I agree with so much of it. Truthfully, and I know you might hate to hear this, but your picky-ness related to dudes is probably a good thing. I feel exactly the same way. Why doesn't it ever work out for me? Why do I pick the wrong people? Why can't someone just get me? I'm chalking that one up to the universe and the fact that I wasn't supposed to meet someone just yet. But when it comes, it will hit me like a pile of bricks. This was such a powerful post to read. Thank you for sharing. oh i don't even know where to start. but i really love this. also, boys are so much work. but when the right one comes, french or german or british or american or what have you, he will be really lucky to have a lovely, honest lady like you :) thank you so much for this. If you don't fail, you didn't try. If you don't succeed, you didn't try. As Beckett once said, "fail better" next time and know you've got a strong support system in your family, friends and readers. @Ginny: Thank you so, so much. It's good to know I'm not the only one, but I also must encourage you to be optimistic! Apparently things happen when you ask for them to :). @Jenn (eating bender): Me too, I think it's necessary even. As I tweeted, I adore that concept of social media comparison because it's so true and so many of fail to realize that nine times out of ten. @Rose: Yep, I'd have to admit I don't hate my selectivity either. It certainly prevents a lot of unnecessary negativity and or drama. Or so I like to think. And actually, I've literally had somewhat of a dude-related phenomenon recently so it's definitely restoring my hope. Ah, and you're so right. I think I get caught in the lovely comparison trap. Most people do have to put effort in. Maybe the trick is to stop putting pressure on myself to love exercising regularly, and to just go out and do it almost every day. That'd be amazing :). I'm glad it had an impact. Although scary, it was certainly satisfying to share on my end, too. @Mackenzie: You are the sweetest. Thank you! @anneliesz: I really appreciate the perspective and support, Annelies. Thank you for sharing Beckett's words with me as well. You're so right.